The Chandra and Swift observations were held in November as scheduled and yielded very interesting data. The AAVSO B, V, and visual observations provided by you were crucial in correlating the satellite X-ray data. Continuing the B, V, and visual observations at least twice weekly is very important to see if the behavior seen so far - especially in B - continues, and to learn more about the overall behavior of RT Cru. Spectroscopy is also requested. High-resolution spectroscopy around Halpha and the [OIII]5007 A line, as well as the spectrum of the full range (echelle, for example), would be very helpful and most welcome! RT Cru varies between 11.2 and 12.6 visual; as of 2015 December 14.375 UT it was V=12.313(029) and B=13.875(097) (HMB, J. Hambsch, Mol, Belgium). 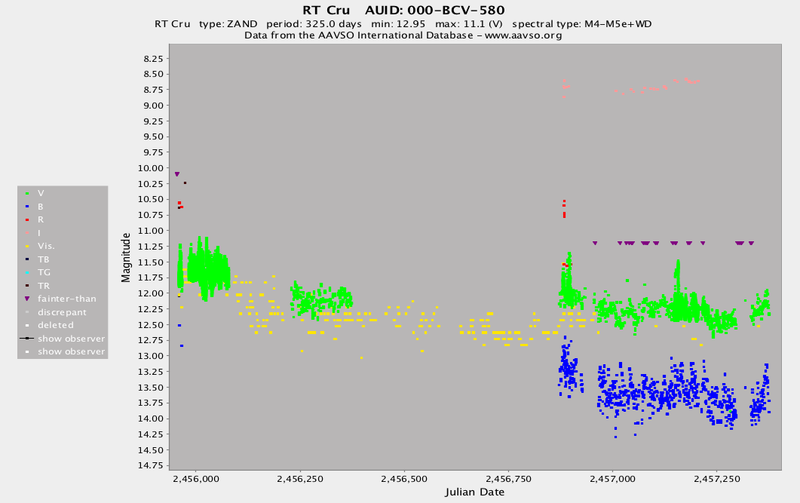 A recent light curve of RT Cru showing the data in the AAVSO International Database appears below. AAVSO light curve of RT Cru, JD 2455958-2457371 (February 2012 - December 2015). 11,628 observations were contributed to this light curve by 22 AAVSO observers worldwide.